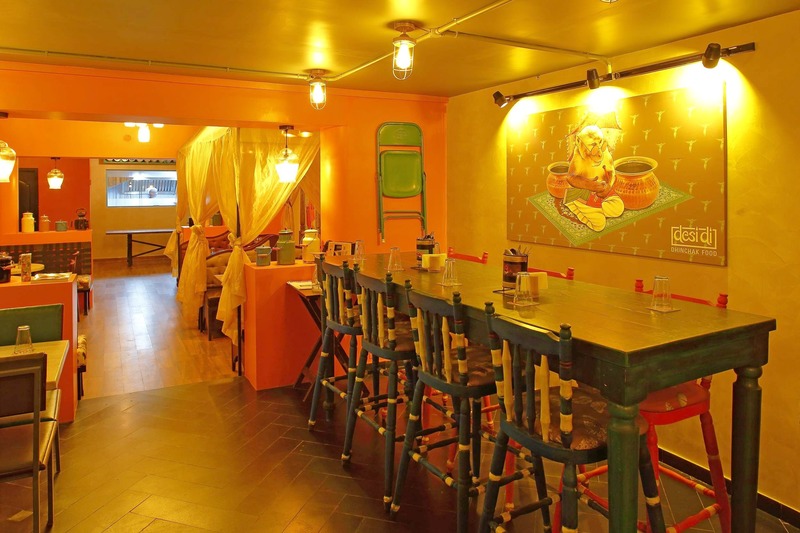 Feel Like You Are Part Of A Bollywood Film At This Newly Opened Restaurant! Feel Like You Are Part Of A Bollywood Film At This Newly Opened Restaurant! Enter the newly opened Desi Di and it feels as though you have entered the sets of a 90s Bollywood film. Vibrant colours, graphic prints on the wall, Bollywood songs on the radio, and North Indian food on the menu. Can't it be any more movie like? We love the look and feel of the place. The furniture is rather causal - ikat prints on sofas, high chairs, cozy sofa sets, wooden tables with intricate carvings - Desi Di is that new kid on the block who is hoping to make a hit in the box office. After shutting down their previous outlet, this newborn restaurant has retained its signature dishes like the Kashmiri Mutton Rogan Josh. Our love for Mumbai will never die down and so we opted for Ragda Pattice. As part of the starters, we also tried their Aloo Chutneywala and the Malai Murgh Kebabs. While the former was spicy and steaming hot, the later was succulent, with a little cheese aftertaste. Paneer is like the SRK of a Karan Johar movie. The paneer tikka was a hit with my companion. Soft, fluffy, with the right spices and the mint chutney. (Did you see us opening our arms like SRK does?) For mains, try any bread and we love how they are crispy and soft. We were amused by the small pressure cookers that bore dal tadka and paneer sabzi. Chicken biriyani is bae - aromatic, juicy, and filling their biriyani did justice too. Don't miss out their lassi which was thick and creamy. For desserts, do try their apple phirni or Gulab Jamun Cheesecake. Heartmelt! They are soon going to have a chat counter that will have everything form dahi papdi chat to pani puri. They are also looking at opening a party hall that needs to be booked in prior.